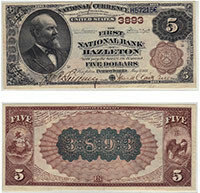 We love territorial red seals, it doesn't matter the denomination, bank of issue, or condition. We have handled lots of them and always enjoy seeing new discoveries. There are only about 30 red seals known from the $20 denomination. All of them should be considered at least scarce. Please contact us if you would like to find out how much yours is worth. Don't forget to check the serial number. Number 1 notes always sell for nice premiums.